Music streaming service we7 have recently launched an ad-free subscription service, offering unlimited music on your PC. And for a limited period you can subscribe to it for only £3.99 a month (it will usually be offered at £4.99). 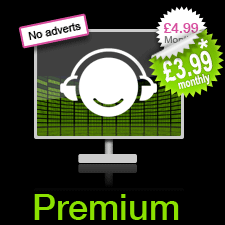 For this you get their usual great service, but will never have to look at or listen to another advert whilst playing music on the site, and can make playlists to your heart’s content. The company was co-founded by Peter Gabriel in May 2007 with the intention of creating somewhere for people to listen to music for free, whilst allowing rights owners and artists to still get paid. This was done with an ad-based model, that attached adverts to the beginning of each song you played. Since then they have built up a library that now has over three million songs, and presumably that’ll grow by at least twelve more on February 15th when Gabriel launches his new album of cover songs, called Scratch My Back. As well as we7 Premium, they are also promising we7 Premium + to be launched very soon that will also include a mobile phone service, intitially only supporting the Apple iPhone and Google Android handsets. Sounds like they might be giving Spotify some serious competition in this area. I look forward to seeing what they offer, and hope they don’t forget to include support for scrobbling to Last.fm. If you’ve listened to the Sunshine Playroom Jukebox on this site before, you’ll already be familiar with we7, and I’m pleased to say that it’s been updated again with a totally brand new selections of songs. Head on over to our Jukebox page to hear great selections from Len, Medicine, Brian Eno, Tricky, Big Audio Dynamite, and also the theme song from Channel 4’s True Blood. Press play, leave it running, and enjoy. Sit back and listen, or open up the page in a new window by clicking the link and carry on doing something else while it plays. Enjoy. Haven’t got time to listen now? No problem, pop back when you do. I’m planning on leaving each playlist up for a week or two, so it’ll be there for a little while. This entry was posted on Monday, February 8th, 2010 at 11:40 pm	and is filed under Music, News, Technology. You can follow any responses to this entry through the RSS 2.0 feed. You can leave a response, or trackback from your own site.